There's much to explore in St Paul's Cathedral, the stunning Baroque church designed by Sir Christopher Wren in 1673. 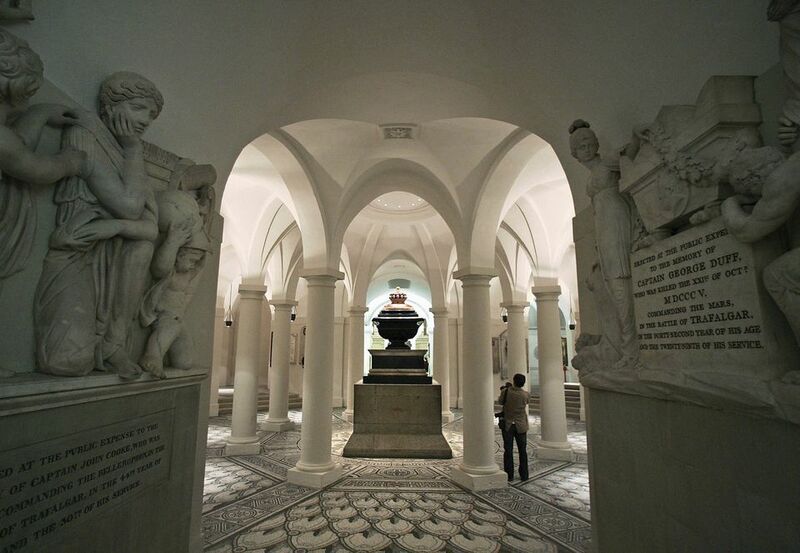 Alongside the awe-inspiring interiors and the striking dome with its three galleries, the crypt is home to tombs of some of the nation's greatest heroes including Admiral Lord Nelson and the Duke of Wellington. The crypt of St Paul’s Cathedral is the largest in Europe. You may wonder where Sir Christopher Wren's memorial is. The great architect is buried in the south aisle in the east of the crypt. The simple tomb is surrounded by tributes to his family and an epitaph reads: "Reader, if you seek his monument, look around you." Wren is buried in an area that pays tribute to tombs and memorials of the painter, Sir Joshua Reynolds, the sculptor, Henry Moore, and the scientist, Alexander Fleming, who discovered penicillin. There are memorials on the cathedral floor and down in the crypt. The largest memorial on the cathedral floor belongs to the Duke of Wellington (it actually took longer to build than the whole cathedral), but you will also find Lord Nelson facing Charles Marquis Cornwallis. Whereas poets are buried at Westminster Abbey, St. Paul's Cathedral's Artists Corner salutes painters including Turner, Millais, and Lord Leighton. Other important names you will find in the crypt include Arthur Sullivan of Gilbert and Sullivan (near the OBE Chapel), Sir Henry Wellcome, Florence Nightingale, William Blake, Lawrence of Arabia and George Washington, as well as huge tombs and chambers for Wellington and Nelson. Nelson's Tomb occupies the best spot as he was the first person of national importance to be buried at St Paul's, so he is right under the dome. His casket though was originally made for Cardinal Wolseley but was put in storage for a few hundred years when Wolseley fell out of favor with Henry VIII when he could not arrange a papal annulment to end his marriage to Catherine of Aragon. The Churchill screen/gates divide the refectory and the crypt so can be seen for free when visiting the cafe, the shop or the public bathrooms. For those who choose not to climb up to the galleries, Oculus is a clever 270-degree film display where you can feel as if you are taking a tour around the cathedral. There's a 14th Century Medieval Priory in London. Have You Seen It?